WWF International recently released “Principles for a Sustainable Blue Economy,” a 2015 briefing that aims to clarify what a “blue economy,” a label now commonly used in the contexts of economics, agriculture, and conservation, truly means. The ocean has long been an economic force to reckon with. The 2015 briefing puts the value of key ocean assets at over US$24 trillion, with two-thirds of that based on assets that require healthy, productive oceans. 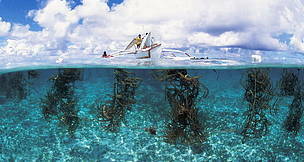 In fact, based on gross marine product, the ocean may be considered the world’s seventh largest economy. The idea of a blue economy is certainly not a new one in the Coral Triangle. In March 2013, Jackie Thomas and Dr Lida Pet Soede of the Coral Triangle Programme co-authored a discussion paper on “WWF and Blue Economies in the Coral Triangle: Developing and Demonstrating Blue Economies for Sustainable Development and Profitable Resource Use in the Region.” They discussed how the term evolved to define a sustainable approach to the use of natural resources, alternately called a green economy, a green economy in a blue or marine world, or a blue economy. While a green economy was generally marked by effective use of natural resources, the definition of a blue economy as one based mainly on healthy marine resources also surfaced. Thomas and Pet Soede noted how, at the United Nations Conference on Sustainable Development (UNCSD) Rio+20 Summit in June 2012, the dependence of many small islands on marine resources highlighted the role of the sea. “Pacific small island developing states advocated that for them, a green economy was in fact a blue economy because of the importance of oceans and fisheries to their livelihoods,” wrote Thomas and Pet Soede. The government-led Coral Triangle Initiative on Coral Reefs, Fisheries and Food Security (CTI-CFF), what the authors call “the most significant oceans initiative ever established in this region,” is committed to supporting such “right” approaches. The 2015 WWF briefing breaks down these approaches even further, offering a working definition of a sustainable blue economy, guidance on governance by both private and public sectors, and necessary actions. The brief defines a sustainable blue economy as one that provides not just economic, but social benefits for present and future generations. A blue economy recognizes marine ecosystems as its natural capital, and protects and maintains them accordingly. It also aspires for social and economic stability through the use of clean technology and renewable energy. The brief characterizes a sustainable blue economy as inclusive, marked by stakeholder participation; well-informed, precautionary, and adaptive; accountable and transparent; holistic, cross-sectoral, and long-term; and innovative and proactive. Finally, the brief presents a number of suggested steps in the creation of a blue economy that are available to the private and public sectors, among them setting clear, measurable and consistent goals; assessing performance in achieving these goals; applying the ecosystem approach to fisheries management (EAFM); and sharing information, best practices, and lessons. Aside from the traditional view of blue economies as being based on marine conservation, Thomas and Pet Soede noted the approach advocated by the term’s originator, author and entrepreneur Gunter Pauli, “to foster entrepreneurship to create sustainability” and create models marked by innovation, adequate food, energy, and jobs, and the conversion of poverty into development, among other characteristics.